The XTENDEX® DVI Extender via Fiber Optic Cable locates a single link digital DVI-D display up to 3,280 feet (1,000 meters) from a computer using a single SC multimode (50-micron or 62.5-micron) fiber optic strand. Each extender consists of a transmitter that connects to a computer and a receiver that connects to a monitor. Complies with DVI 1.0 standards. Signal transmission via one strand multimode (50-micron or 62.5-micron) SC fiber optic cable – no RF interference. Small form factor – for easy connection and placement. 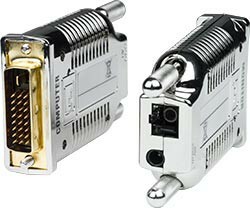 Connectors (for transmitter and receiver): one male DVI-D single link connector and one SC fiber connector. Supports resolutions up to 1920x1200 (WUXGA); refer to the resolution chart below for resolutions at different lengths. Laser Class 1 Safety compliant. Optical source: 850 nm VCSEL. Supports 50/125um SC type multi-mode fiber optic cable. 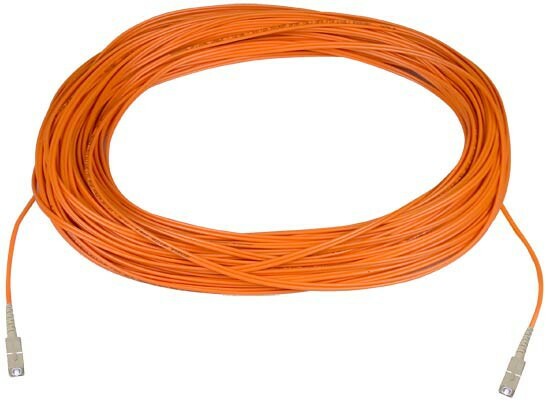 Use a simplex multimode SC 50-micron (FIBER-S-SCSC-50-xM) or 62.5-micron multimode fiber optic cable to extend the receiver from the transmitter up to 3,280 feet (1,000 meters).